One of the benefits of our recently empty nest was getting a guest room again. We lost a bedroom when we downsized four years ago and I’ve been missing it ever since. Overnight guests made do by using a sleeper sofa in our office but it wasn’t ideal. Our son’s furniture was a mismatch of pieces picked up through the years. He needed a new mattress, but I wasn’t going to fork it over for an adult child still at home. No reason to make it TOO comfortable. Once he was gone though, we needed to figure out how to furnish the room. The room became empty in mid-May and the first guest was scheduled to arrive the end of July. We worked on clearing out the room little by little and giving it a good cleaning. Then three weeks ago, we became serious and executed my furniture plan. The set in our master bedroom was bought brand new…25 years ago! I was ready for a new set but it was still in good condition. 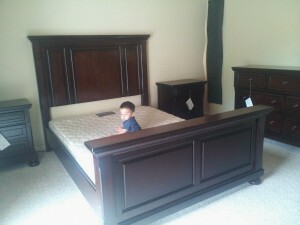 So, we decided to move that furniture into the guest room and buy a new set for the master. It wasn’t my most frugal moment but since I only buy a set every quarter century, we decided it was worth it to get the style and color we wanted. Don’t worry, we paid for it with the credit card which will be paid in full when the bill is due. The new set was delivered last week and I’m starting to get used to the new look every time I walk into the bedroom. The biggest job for my husband was moving the furniture; for me it was moving my clothes from one dresser to another. I took the opportunity to donate items in good condition that aren’t use and throw out worn items. My sister is arriving tomorrow and we made the deadline. Now, on to the next project! I had 6 guest in my house recently. MIL, wife’s niece and friend and 3 friends. 3 kids were bumped into the basement! Basements are great, but I’ve never seen one here in Southern California. P.S. It’s fun having visitors, but it’s always nice when they leave too. Your new bedroom set looks really nice! Guest rooms seem to attract guests, which is okay a week at a time. Krantcents, Thanks. We really like it but it’s quite a change from the light oak set we had. I think a week is a good time to stay in one place. That’s a nice set. I’m too cheap for that, so I’m working on building my own platform bed for the master because we want to upgrade to a king size, and the bed sets are out of my budget. Brave New Life, since this is probably the last set we’ll ever buy I wanted to buy something we can live with for 25 or more years. I admire your carpenter skills in building your own! I like your new set & the cutie on the bed! We still have the 4-bedroom house we’ve had since 1977. The master bedroom has been the site of the pool table for many years & I’m ready to get rid of it & reclaim our master bedroom! We still have the platfoorm bed that my husband made in 1976 & we’re fine with it. The main thing was getting a new mattress after all those years! Much better on the back! Our smallest bedroom has turned into an office & gift wrapping center with my stash of gifts that I accumulate year round. With family & grandkis visiting more often we need our bedrooms again! Maggie, He is a cutie, isn’t he! That is the old mattress we put there as a placeholder. I’ll have more to say about mattresses soon. I support you in your quest to reclaim your master bedroom. Good luck! Cute grandson! Must be AWESOME to have that extra bedroom back! Glad your son found something new. Thanks, Sam. I think he’s pretty cute too! My son is really enjoying Florida but the heat and humidity are requiring a bit of adjustment. I love the set you chose! @ Jackie/Freeismylife, Good idea. I’ll do an end result photo. @ Super Frugalette, Thanks. For the first week, I was surprised each time I walked in my bedroom to see it (after 25 years with the other set) but really like it. My 21-year-old son has graduated from college and is off to Officer Candidate School at Ft Benning so we have a spare room now. Thanks for the great ideas! Congratulations to your son on his new career. I have a soft spot for the military being a vet myself. Enjoy your new guest room! I had a guest room for almost a year, before my oldest kid boomeranged on us. We love having him around, but I do miss the guest room. And, it was always clean. We’ll have plenty of room soon enough, since both of our kids are now adults. Right now, I have 8 people living in my house, but that will change as the summer winds down. That’s one of the drawbacks of living at the beach. Bret, don’t say the boomerang word too loud. I don’t want my sons to hear. 🙂 I think living at the beach is probably worth the extra guests. Hope you’re having a great summer and look forward to seeing yo at our next meetup. A Good Night’s Sleep with Tempur-Pedic! Next post: Using the web before travel, better memories after!